An apparent bald eagle was sighted briefly Saturday in the Takoma D.C. neighborhood. The immature bald eagle, a dusky color with characteristic white mottling on its breast, landed in a large tree in the 6500 block of 7th Street N.W., near the home of Carolivia Herron, who recorded the unusual event with her video camera. Herron said she and her mother, Georgia Herron, were alerted to the eagle’s arrival around 5:30 p.m. by the noisy reception it got from Georgia’s dog, Hezekiah, and some very agitated crows. “The animals were distressed.” said Carolivia Herron. Even her normally self-confident cat, Xanthus, who was outside, “came slinking in,” apparently aware that some thing was amiss. Georgia Herron spotted the eagle perched in the largest tree on the block behind a neighbor’s house two doors away. When Carolivia saw how large the bird was, she ran to get her video camera. Carolivia Herron said her mother feeds the neighborhood birds in their wooded backyard, and they occasionally have seen red-winged hawks, but Saturday’s visitor was much larger. “It was like he could put one [red-winged hawk] under his arm, you wouldn’t even notice it, it was so big,” Herron said. Turning on her video camera as she ran back outside, Carolivia Herron captured several minutes of action as about a half dozen crows flew around the eagle and a mockingbird dive-bombed it, all to little effect. The eagle “was just snapping at them when they came close and looking around,” Herron said. She described the eagle as more playful than menacing as it snapped at its antagonists. Though known for majestically swooping into rivers and streams to prey on fish, their primary food, bald eagles are gastronomic opportunists and sometimes eat carrion. Saturday’s visitor to Takoma D.C. might have been attracted by a dead opossum on 7th Street in front of the Herron house. The nearest significant bodies of water are Rock Creek, one mile to the west, and Sligo Creek, two miles to the east. 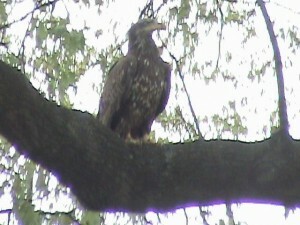 The eagle eventually flew south in the direction of Underwood Street, Carolivia Herron said. 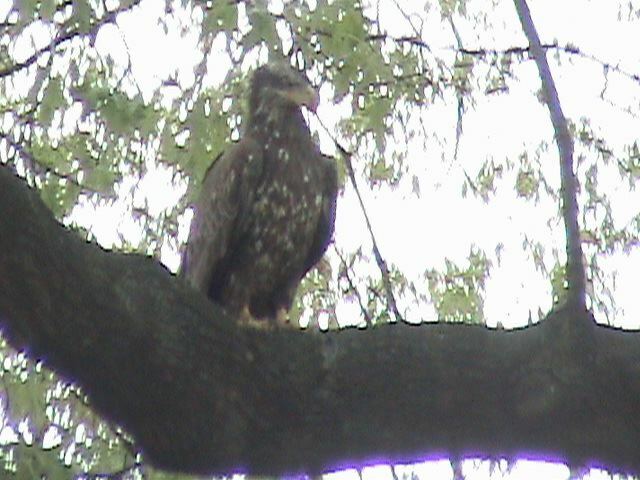 Update (9:37 a.m. 4-18-12): Nick Bartolomeo, chief ranger at Rock Creek Park, said today there are no bald-eagle nests in the park but that an adult bald eagle was sighted by park staff near Peirce Mill within the past two weeks. The mill is on Rock Creek near the intersection of Beach Drive and Tilden Street N.W. 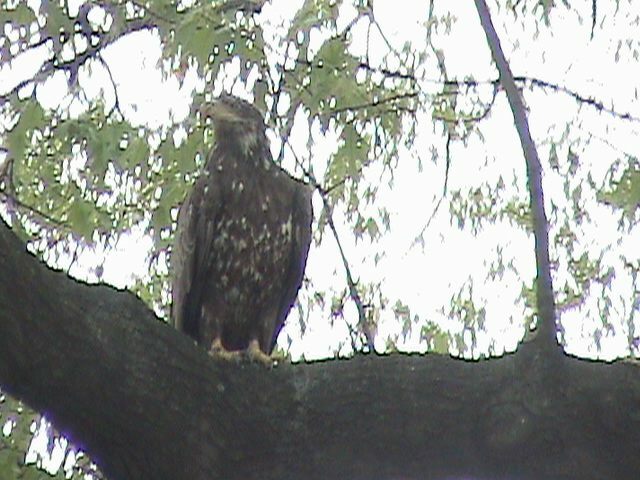 This entry was posted in Bald eagles, Takoma D.C., Urban wildlife and tagged Bald eagles by Wayne Savage. Bookmark the permalink.